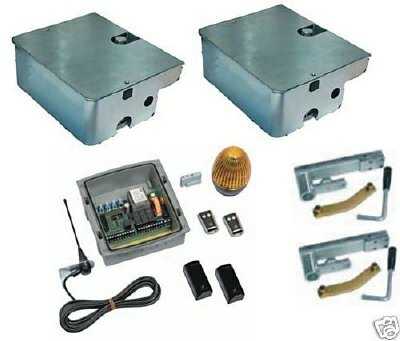 The V2 VULCAN kit with high power high quality underground motors for twin electric gates is suitable for up to a 7m opening or gate leaves of up to 800 Kg per leaf. This kit gives you the opportunity to automate your gates at a fraction of the cost charged by installation companies!!!! You are buying from someone with many years experience in the gate automation business and who has successfully tried and tested this equipment on many gate installations. All equipment meets CE European approvals unlike some systems for sale. 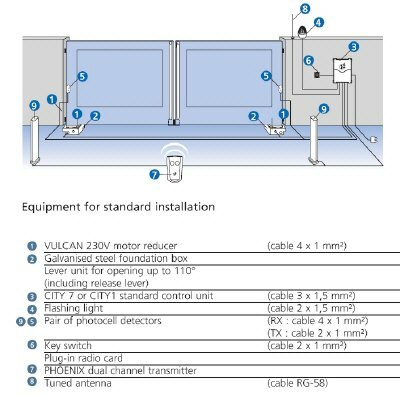 All equipment installed in the UK and Europe must be CE approved by law. no other approvals are acceptable. The electric gate motor is a high power unit with unique features such as:-Fully bushed centre spindle, bushed links, heavy duty bearing gate support/pivot. Gate Weight Max. 800kg, Maximum leaf size 3.5m (7m total opening) Thermal protection 150 degrees C, Maximum opening angle 110 degrees (360 degrees with OPTIONAL chain kit) 300W motor. Environmental protection to IP67. working temp -20 to +50 degrees C. Standard opening time to 90 degrees without slow down 15 seconds. Internal mechanical stops are included at both the open and closed positions. These motors can also be retrofitted to CAME ® Frog foundation cases. When fitting these underground electric gate motors you will need a minimum of 67mm from your gate hinge point to the post. Though soak aways may be adequate we recomend that you drain the motor case to a drain or lower laying land where possible. All underground motors will operate underwater when new but if left submerged it is likely that water will enter the motor eventually. It is better to correctly drain the foundation cases from day one to protect your investment! Some fabrication/welding may be necessary to connect the drive shoe to your gates. A flashing beacon can be supplied FOC on request though most people do not bother fitting these!! It is possible to operate this system with almost any intercom, keypad, access control system etc. The above kit comes with a full warranty and free technical help from one of the countries leading electric gate kit suppliers. The complete kit weighs more than 50 Kg delivery to IOM, Northern & Southern Ireland is £80, Collection by arrangement is fine if you wish. A valid VAT receipt will be issued on completion.